In the late 1970s, as the third decade of the Cold War was drawing to a close, communist Czechoslovakia came up with a remarkable proposal: a 410km (254.8 mi.) railway tunnel under the Alps, linking the Czech city of České Budějovice with the Yugoslav port of Koper. However improbable it may seem, the governments of Czechoslovakia, Austria, Italy and Yugoslavia went so far as to open tentative discussions on the proposal. Then suddenly the project was shelved, and the idea was forgotten. The proposed 410km (254.8 mi.) railway tunnel under Austria, linking the Czech city of České Budějovice with today’s Slovenia. The Czech Republic is a wonderful place; its verdant valleys are dotted with fairytale castles, and its perimeter is ringed by lush forests and lofty peaks. But a cursory glance at a map of Europe will reveal, even to the most geographically challenged, a single glaring shortcoming: it’s about as landlocked as you can get. For an economy driven primarily by export, that’s always been a problem. Barring a short-lived period in the 13th century when the medieval Kingdom of Bohemia stretched as far as modern-day Slovenia, the Czechs have never been able to ship their wares to distant shores—or dip their toes in the foaming surf—without first undertaking an arduous overland journey. Enter Karel Žlábek, a Czech professor with a cunning plan: a railway tunnel that would stretch from Czechoslovakia to the shores of the Adriatic, 410km to the south. The greatest natural obstacle to trade and tourism between Central Europe and the Mediterranean would be overcome. At 67.3km, Line 3 of the Guangzhou metro is the longest transit tunnel in use today. All of Žlábek’s tunnels would have been longer, and two of the three would have been roughly twice as long. 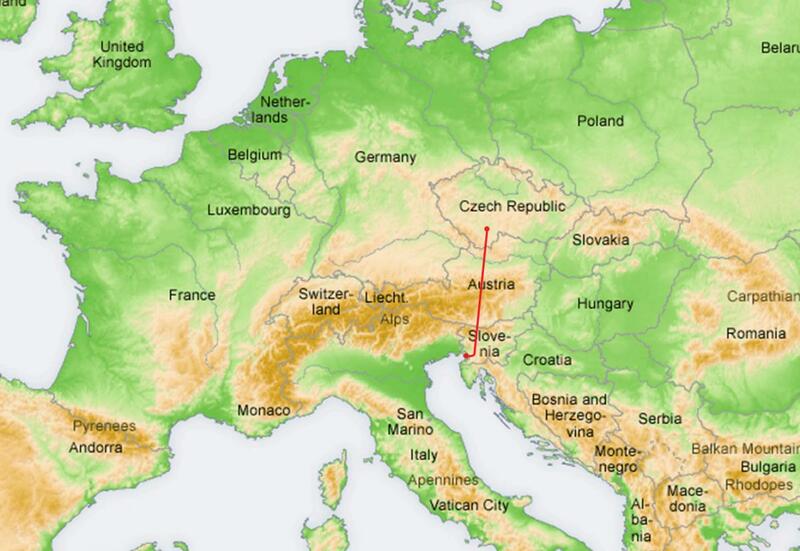 Professor Žlábek created the shortest possible route of all: a railway tunnel running directly beneath the Alps. Upon examination of the blueprints—now carefully stored in the Pragoprojekt archives in the Prague district of Krč—it is immediately obvious that the professor’s idea was breathtakingly ambitious. High-speed freight and passenger trains would depart on a single-track line from České Budějovice, the southern Czech city known for its traditional Budvar beer. After traveling 6km (3.7 mi.) down a gentle slope the trains would enter the first of three tunnels, at 73km (45.4 mi.) the shortest of the project. The Czech end of the tunnel was in Soviet territory, but at the 43km (26.7 mi.) mark the train would slip under the Iron Curtain and enter Austria, emerging 30km (18.6 mi.) later into the sun-dappled Danube valley and stopping just east of Linz. Here, Austrian freight wagons and passenger carriages would be coupled to the electric locomotives. West German consumer goods bound for freighters in the Mediterranean would also be loaded here, having been shipped down the Danube. After Linz the line would become double-track, and the trains would embark on a slow 38km (23.6 mi.) climb to the longest of the tunnels, traveling 139km (86.4 mi.) under the mighty Styrian and Carinthian Alps. They would briefly emerge into the daylight again in order to cross the Wörthersee, an Alpine lake west of Klagenfurt. After rattling over suspension bridges for 11km (6.8 mi.) the trains would disappear into the final tunnel, whose 132km (82.0 mi.) would bring them into what was then Yugoslavia, where they would travel the final 12km (7.5 mi.) overland stretch. Here the line would perform a tight dogleg turn, skirting the Italian port of Trieste before finally arriving in Koper, in what is today Slovenia. Slightly more fanciful was Žlábek’s pièce de résistance, a Czechoslovak seaport called Adriaport. The soil from the tunnel excavation work would be piled into the waves just west of Koper to create an artificial island. The island would serve as a freight terminal, becoming Czechoslovak territory after the requisite bilateral agreement with Yugoslavia had been signed. At Adriaport goods would be unloaded and transferred to waiting freight ships. Meanwhile, Czechoslovaks, Austrians and other tourists, after a comfortable two-hour rail journey, would be reunited with their vehicles, which had travelled behind them on railway carriages. They could be on the beaches of Croatia by lunchtime, in Dubrovnik for dinner. Or perhaps join the autostrada at Trieste—just up the road from Koper—and speed off into the Italian sun. Oddly, the official documentation contains no mention of security concerns; in 1979 foreign travel for average citizens of communist Czechoslovakia was a distant dream involving an endless round of permits from their employers, their local Party official and the police before they could apply for the much-sought-after (and frequently denied) permit to leave the country and exchange Czechoslovak crowns for Yugoslav dinars or Italian lira. All this, plus the trouble and expense of obtaining visas to enter those countries. How would the tunnel be secured to stop Czechoslovak tourists making a run for it at Linz, instead of spending their requisite two weeks on the beach in Yugoslavia before dutifully heading back home to the workers’ paradise? Of this, there is no word. But let’s imagine for a moment that the political and security difficulties could have been overcome. Certainly it would have been a far more pleasant journey than the hours Czech tourists currently spend sitting in traffic jams on the Austrian and Croatian motorways, or the 20 hours the Adriatic Express takes to cover the 1,000km from Prague to Split by rail. Not to mention the achingly slow car journey to Italy. Svoboda points out that design-wise, the tunnel was far ahead of its time: the professor envisioned twin tunnels connected by a service tunnel with regular shafts for ventilation and emergency access. Today’s modern railway tunnels are built in almost precisely the same way. Žlábek was also something of a visionary environmentalist; the tunnel was about as green as you can get. To say the professor was committed to his project is something of an understatement. 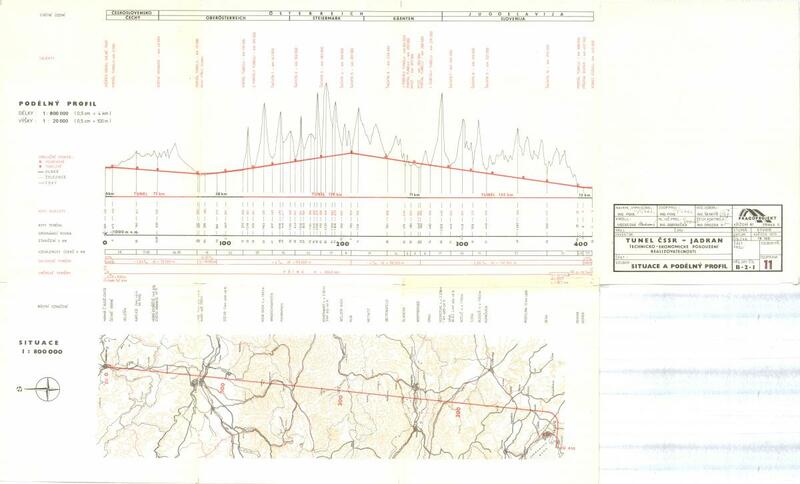 According to the original 1979 documents kept in the Pragoprojekt archives, Professor Žlábek first began toying with the idea of an underground railway to the Adriatic in 1944, in the closing months of the war. The first written mention of the tunnel came three years later in 1947, in Žlábek’s study of the future of economic relations between Czechoslovakia and Germany, commissioned by the Ministry of Foreign Affairs. But it wasn’t until 1975, after years of effort, that Professor Žlábek was finally invited to submit a full blueprint to Czechoslovakia’s communist government. Pragoprojekt, then a state company, was put in charge of overseeing the plans. As Pragoprojekt’s draftsmen laboured away on the blueprints, Žlábek campaigned tirelessly for the idea, lobbying politicians and diplomats, communists and capitalists, at one point even gaining the ear of the president of Austria. He lectured at universities and appeared on radio and television, tantalising the public on both sides of the Iron Curtain with the notion of a railway tunnel to the sea. In 1978 and 1979, the plans were revised, and—astonishingly—the first tentative inter-governmental meetings were held between communist Czechoslovakia, neutral Austria, capitalist Italy and socialist Yugoslavia. Then, suddenly, the idea was shelved. When Professor Žlábek died in 1984, it was clear his dream would never become reality. At least not in the 20th century. Even without the political concerns, it would, of course, have been astronomically expensive. The original 1979 study estimated the total cost at some 258 billion Czechoslovak crowns. Adjusted for inflation, today that figure would be the equivalent of some three trillion Czech crowns or €177 billion (roughly the cost of saving Greece from bankruptcy). It would also have taken about 30 years to finish. So if the four countries involved had signed a memorandum in 1979 and begun tunnelling, say, four years later, they’d be cutting the ribbon round about now. The decisive factor, however, was Cold War politics. While Professor Žlábek was showing plans to the Austrian president and having lunch with the Italian ambassador, the apparatchiks of the Czechoslovak Communist Party—always with one eye on the mood in Moscow—were shifting nervously in their seats. Martin Vaněk, the student whose 2008 dissertation on high-speed railway routes beneath the Alps reignited media interest in Professor Žlábek’s tunnel, was rather more prosaic. ‘If you want my opinion, it was a totally unrealistic project then and it’s totally unrealistic now. It was very much an idea of its time, and proposed in totally different political-economic circumstances,’ he told me. Rob Cameron is originally from London but has spent the last 20 years living in the Czech Republic, and now covers the region for the BBC and others. As a journalist he's always intrigued and often delighted by local oddities of all kinds, so a tunnel to the Adriatic instantly piqued his curiosity.